The ANITA Mk VII and the Mk 8 were launched simultaneously in October 1961. The first ANITA model to complete development was the ANITA Mk 7 (see photograph above), which was ready for sale in late 1960. However, it required a slightly complicated method of multiplication involving the column of "Tab" keys on the left as well as the multiplication keys on the right. However, this did not find favour with the company's sales force who were afraid that the new operator skills required would cause confusion among the army of mechanical Sumlock operators in the field. Fortunately, the export division welcomed it into their market for decimal calculators and it was launched at the 1961 Hamburg Business Equipment Fair (Oct. 10th. - 13th) by its German distributor Büromaschinen-Vertriebsgesellschaft m.b.H.. This model was sold mainly in continental Europe, especially in Germany, Holland, and Belgium. Headline and photograph from an article in the journal 'Der Büromaschinen Mechaniker' of November 1961 announcing the launch of the ANITA Mk VII . The electronics Buromaschinen-Vertiebsgesellchaft [Office Machine Marketing Company] m.b.H., of Hamburg 22, Karlstrasse 2, and branch in Wuppertal-Barmen, now brings with the "Anita" the first portable electronic calculator on the market. "Anita" is the latest product of the Bell Punch Company Ltd., known by the key-driven Sumlock adding machines and Plus high-speed adding machines, in Uxbridge, England. While the fate of the ANITA Mk VII was being decided, development continued to produce a machine to a British market specification, and this became the ANITA Mk 8 (also designated the Mk VIII, see photograph above). The Mk 8 was launched in Britain, the week before the launch of the Mk VII in Germany, at the 1961 Business Efficiency Exhibition in London (2nd. - 11th. October) by its British distributor Sumlock Comptometer Ltd., but orders were not being taken until January 1962. This machine proved to be very successful and many thousands were produced at the company's Portsmouth factory and sold around the world. 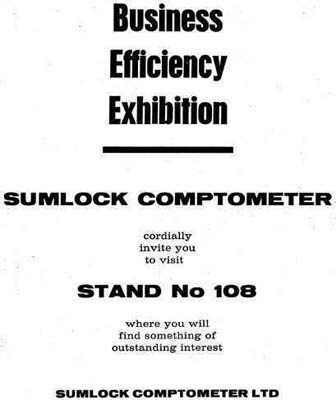 Sumlock Comptometer advertisement in October 1961 with an invitation to visit their stand at the Business Efficiency Exhibition, in London, "where you will find something of outstanding interest" - the ANITA Mk 8. 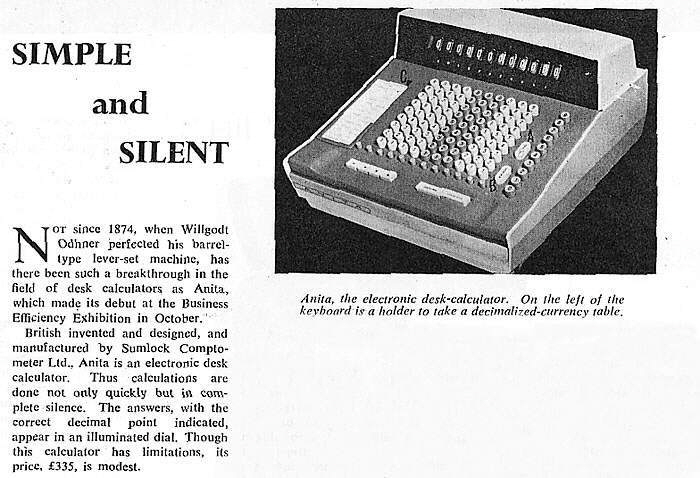 Headline and photograph from an article in the journal 'Office Magazine' for December 1961, announcing the ANITA Mk 8. The full article is on the Review of ANITA Mk 8 page. In reviews of the ANITA calculators immediately after their launch, it was noted with enthusiasm how easy they were to use, and how quick and silent they were. Note that the selling price, at about £355 Sterling [about US$1000] was very competitively priced compared to electro-mechanical calculators similarly capable of automatic multiplication and division. Although the ANITA was launched in late 1961, at the annual general meeting of Lamson Industries (the parent company) in April 1962 it was reported that it had been planned to commence production of ANITA in the latter part of 1961, building up production rapidly, but unfortunately technical and supply problems set back this plan, with the result that substantial production will only be achieved in the second half of 1962 . Problems were to be expected, of course, in producing such an innovative machine. However, these continued for some time. At the Lamson Industries annual general meeting the following year (1963) the chairman reported that "Unfortunately, supply difficulties continued longer than expected and it was only in December  that we began to approach our target output. Production is now flowing more smoothly and this machine should make a material contribution to our results in 1963". 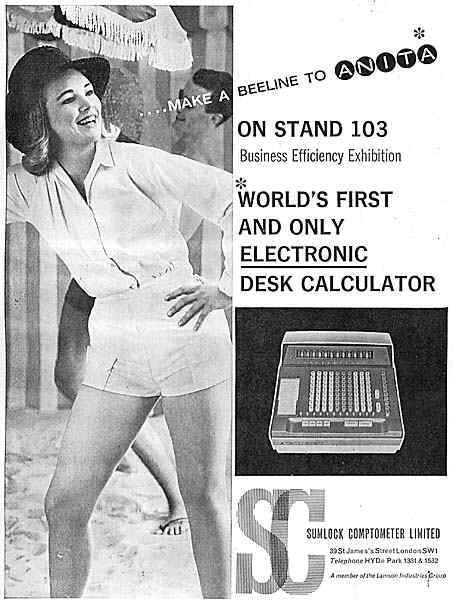 Fortunately, it was to be 1964, over 2 years after the launch of the ANITA before there was serious competition from other companies introducing electronic calculators. 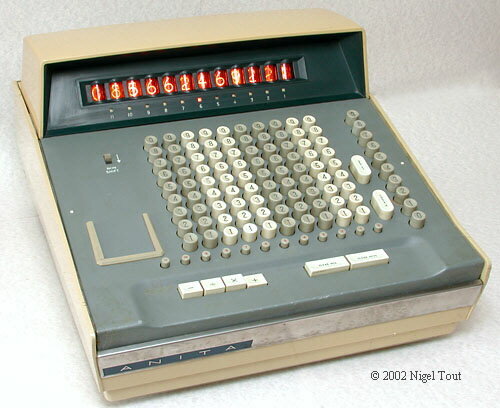 In that year Norbert Kitz (who had lead the development of ANITA) announced that there were annual sales of nearly 10,000 ANITA calculators, so production and sales had taken off. Advertisement for the ANITA Mk 8, on show for the second year at the 1962 Business Efficiency Exhibition, at Olympia in London. See the Advertisements Section for more ANITA advertisements. This photograph, from "The Magazine of Control Systems Ltd." of Winter 1959, shows Mr. R. Walter taking the Press Release meeting through the Sumlock range prior to the introduction of the Sumlomatic." The various models in the development of the Sumlock mechanical calculators were the Mk I through to the Mk VI (with "SAM" or Semi-Automatic Multiplier). The ANITA electronic models, which followed on, used the next numbers in this series. "Lamson Industries Limited", The Times, 30th April 1962. "Lamson Industries Limited", The Times, 4th April 1963.